For followers of the religious doctrine condemned as heresy by the Roman Catholic Church, see Pelagianism. The name Pelasgians (/pəˈlæzdʒ(i)ənz, -ɡiənz/; Ancient Greek: Πελασγοί, Pelasgoí, singular: Πελασγός, Pelasgós) was used by classical Greek writers to either refer to populations that were the ancestors or forerunners of the Greeks, or to signify all pre-classical indigenes of Greece. In general, "Pelasgian" has come to mean more broadly all the indigenous inhabitants of the Aegean Sea region and their cultures, "a hold-all term for any ancient, primitive and presumably indigenous people in the Greek world". During the classical period, enclaves under that name survived in several locations of mainland Greece, Crete, and other regions of the Aegean. Populations identified as "Pelasgian" spoke a language or languages that at the time Greeks identified as "barbaric", though some ancient writers nonetheless described the Pelasgians as Greeks. A tradition also survived that large parts of Greece had once been Pelasgian before being Hellenized. These parts fell largely, though far from exclusively, within the territory which by the 5th century BC was inhabited by those speakers of ancient Greek who were identified as Ionians and Aeolians. Much like all other aspects of the "Pelasgians", their ethnonym (Pelasgoi) is of extremely uncertain provenance and etymology. Michel Sakellariou collects fifteen different etymologies proposed for it by philologists and linguists during the last 200 years, though he admits that "most ... are fanciful". An ancient etymology based on mere similarity of sounds linked pelasgos to pelargos ("stork") and postulates that the Pelasgians were migrants like storks, possibly from Egypt, where they nest. Aristophanes deals effectively with this etymology in his comedy The Birds. One of the laws of "the storks" in the satirical cloud-cuckoo-land, playing upon the Athenian belief that they were originally Pelasgians, is that grown-up storks must support their parents by migrating elsewhere and conducting warfare. Gilbert Murray summarizes the derivation from pelas gē ("neighboring land"), current at his time: "If Pelasgoi is connected with πέλας, 'near', the word would mean 'neighbor' and would denote the nearest strange people to the invading Greeks". Julius Pokorny derives Pelasgoi from *pelag-skoi ("flatland-inhabitants"); specifically "inhabitants of the Thessalian plain". He details a previous derivation, which appears in English at least as early as William Gladstone's Studies on Homer and the Homeric Age. If the Pelasgians were not Indo-Europeans, the name in this derivation must have been assigned by the Hellenes. Ernest Klein argued that the ancient Greek word for "sea", pelagos and the Doric word plagos, "side" (which is flat) shared the same root, *plāk-, and that *pelag-skoi therefore meant "the sea men", where the sea is flat. This could be connected to the maritime marauders referred to as the Sea People in Egyptian records. Subsequent scholarship shows that the connection between the two roots is "phonetically impossible". Map of Pelasgians and Pelasgus. Literary analysis has been going on since classical Greece, when the writers of those times read previous works on the subject. No definitive answers were ever forthcoming by this method; it rather served to better define the problems. The method perhaps reached a peak in the Victorian era when new methods of systematic comparison began to be applied in philology. Typical of the era is the long and detailed study of William Ewart Gladstone, who among his many talents was a trained classicist. Until further ancient texts come to light, advances on the subject cannot be made. The most likely source of progress regarding the Pelasgians continues to be archaeology and related sciences. The Pelasgians first appear in the poems of Homer: those who are stated to be Pelasgians in the Iliad are among the allies of Troy. In the section known as the Catalogue of Trojans, they are mentioned between mentions of the Hellespontine cities and the Thracians of south-eastern Europe (i.e., on the Hellespontine border of Thrace). Homer calls their town or district "Larisa" and characterises it as fertile, and its inhabitants as celebrated for their spearsmanship. He records their chiefs as Hippothous and Pylaeus, sons of Lethus son of Teutamus, thus giving all of them names that were Greek or so thoroughly Hellenized that any foreign element has been effaced. In the Odyssey, Odysseus, affecting to be Cretan himself, instances Pelasgians among the tribes in the ninety cities of Crete, "language mixing with language side by side". Last on his list, Homer distinguishes them from other ethnicities on the island: "Cretans proper", Achaeans, Cydonians (of the city of Cydonia/modern Chania), Dorians, and "noble Pelasgians". The Iliad also refers to "Pelasgic Argos", which is most likely to be the plain of Thessaly, and to "Pelasgic Zeus", living in and ruling over Dodona, which must be the oracular one in Epirus. However, neither passage mentions actual Pelasgians; Myrmidons, Hellenes, and Achaeans specifically inhabit Thessaly and the Selloi are around Dodona. They all fought on the Greek side. Plain of Thessaly, to the west of classical Pelasgiotis, but in the original range of the Pelasgians. The Pindus Mountains are visible in the background. The river is the Peneus. Towards the sea lie the Carians and the Paeonians, with curved bows, and the Leleges and Caucones, and the goodly Pelasgi. Later Greek writers offered little unanimity over which sites and regions were "Pelasgian". One of the first was Hesiod; he calls the oracular Dodona, identified by reference to "the oak", the "seat of Pelasgians", clarifying Homer's Pelasgic Zeus. He mentions also that Pelasgus (Greek: Πελασγός, the eponymous ancestor of the Pelasgians) was the father of King Lycaon of Arcadia. Asius of Samos (Ancient Greek: Ἄσιος ὁ Σάμιος) describes Pelasgus as the first man, born of the earth. 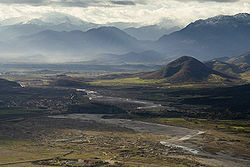 In Aeschylus's play, The Suppliants, the Danaids fleeing from Egypt seek asylum from King Pelasgus of Argos, which he says is on the Strymon including Perrhaebia in the north, the Thessalian Dodona and the slopes of the Pindus mountains on the west and the shores of the sea on the east; that is, a territory including but somewhat larger than classical Pelasgiotis. The southern boundary is not mentioned; however, Apis is said to have come to Argos from Naupactus "across" (peras), implying that Argos includes all of east Greece from the north of Thessaly to the Peloponnesian Argos, where the Danaids are probably to be conceived as having landed. He claims to rule the Pelasgians and to be the "child of Palaichthon (or 'ancient earth') whom the earth brought forth". The Danaids call the country the "Apian hills" and claim that it understands the karbana audan (accusative case, and in the Dorian dialect), which many translate as "barbarian speech" but Karba (where the Karbanoi live) is in fact a non-Greek word. They claim to descend from ancestors in ancient Argos even though they are of a "dark race" (melanthes ... genos). Pelasgus admits that the land was once called Apia but compares them to the women of Libya and Egypt and wants to know how they can be from Argos on which they cite descent from Io. In a lost play by Aeschylus, Danaan Women, he defines the original homeland of the Pelasgians as the region around Mycenae. Sophocles presents Inachus, in a fragment of a missing play entitled Inachus, as the elder in the lands of Argos, the Heran hills and among the Tyrsenoi Pelasgoi, an unusual hyphenated noun construction, "Tyrsenians-Pelasgians". Interpretation is open, even though translators typically make a decision, but Tyrsenians may well be the ethnonym Tyrrhenoi. Euripides calls the inhabitants of Argos "Pelasgians" in his Orestes and The Phoenician Women. In a lost play entitled Archelaus, he says that Danaus, on coming to reside in the city of Inachus (Argos), formulated a law whereby the Pelasgians were now to be called Danaans. Here, when a sacrifice had been prepared to Jove, according to the custom of their land, and when the ancient altar glowed with fire, the Greeks observed an azure colored snake crawling up in a plane tree near the place where they had just begun their sacrifice. Among the highest branches was a nest, with twice four birds--and those the serpent seized together with the mother-bird as she was fluttering round her loss. And every bird the serpent buried in his greedy maw. All stood amazed: but Calchas, who perceived the truth, exclaimed, "Rejoice Pelasgian men, for we shall conquer; Troy will fall; although the toil of war must long continue--so the nine birds equal nine long years of war." And while he prophesied, the serpent, coiled about the tree, was transformed to a stone, curled crooked as a snake. Hecataeus of Miletus in a fragment from Genealogiai states that the genos ("clan") descending from Deucalion ruled Thessaly and that it was called "Pelasgia" from king Pelasgus. A second fragment says that Pelasgus was the son of Zeus and Niobe and that his son Lycaon founded a dynasty of kings of Arcadia. A fragment from the writings of Acusilaus asserts that the Peloponnesians were called "Pelasgians" after Pelasgus, a son of Zeus and Niobe. Hellanicus of Lesbos concerns himself with one word in one line of the Iliad, "pasture-land of horses", applied to Argos in the Peloponnesus. What is said about it is reported by different authors and all accounts differ. The explanation is trivial and mythical, but all accounts agree that Hellanicus said the term Argeia (gē) or Argolis once applied to all Peloponnesus and that Pelasgus and his two brothers received it as an inheritance from their father, named either Triopas, Arestōr or Phorōneus. Pelasgus built the citadel Larisa of Argos on the Erasinus river, whence the name Pelasgic Argos (of the Peloponnesus), but later resettled inland, built Parrhasia and named the region or caused it to be named Pelasgia, to be renamed Arcadia with the coming of the Greeks. According to Hellanicus, from Pelasgus and his wife Menippe came a line of kings: Phrastōr, Amyntōr, Teutamides and Nanas (kings of Pelasgiotis in Thessaly). During Nanas's reign, the Pelasgians were driven out by the Greeks and departed for Italy. They landed at the mouth of the Po River, near the Etruscan city of Spina, then took the inland city "Crotona" (Κρότωνα), and from there colonized Tyrrhenia. The inference is that Hellanicus believed the Pelasgians of Thessaly (and indirectly of Peloponnesus) to have been the ancestors of the Etruscans. I am unable to state with certainty what language the Pelasgians spoke, but we could consider the speech of the Pelasgians who still exist in settlements above Tyrrhenia in the city of Kreston, formerly neighbors to the Dorians who at that time lived in the land now called Thessaliotis; also the Pelasgians who once lived with the Athenians and then settled Plakia and Skylake in the Hellespont; and along with those who lived with all the other communities and were once Pelasgian but changed their names. If one can judge by this evidence, the Pelasgians spoke a barbarian language. And so, if the Pelasgian language was spoken in all these places, the people of Attica being originally Pelasgian, must have learned a new language when they became Hellenes. As a matter of fact, the people of Krestonia and Plakia no longer speak the same language, which shows that they continue to use the dialect they brought with them when they migrated to those lands. Herodotus alludes to other districts where Pelasgian peoples lived on under changed names; Samothrace and "the Pelasgian city of Antandrus" in the Troad probably provide instances of this. He mentions that there were Pelasgian populations on the islands of Lemnos and Imbros. Those of Lemnos he represents as being of Hellespontine Pelasgians who had been living in Athens but whom the Athenians resettled on Lemnos and then found it necessary to reconquer. This expulsion of (non-Athenian) Pelasgians from Athens may reflect, according to the historian Robert Buck, "a dim memory of forwarding of refugees, closely akin to the Athenians in speech and custom, to the Ionian colonies". Herodotus also mentions the Cabeiri, the gods of the Pelasgians, whose worship gives an idea of where the Pelasgians once were. As for the Hellenes, it seems obvious to me that ever since they came into existence they have always used the same language. They were weak at first, when they were separated from the Pelasgians, but they grew from a small group into a multitude, especially when many peoples, including other barbarians in great numbers, had joined them. Moreover, I do not think the Pelasgian, who remained barbarians, ever grew appreciably in number or power. He states that the Pelasgians of Athens were called "Cranai" and that the Pelasgian population among the Ionians of the Peloponnesus were the "Aegialian Pelasgians". Moreover, Herodotus mentions that the Aeolians, according to the Hellenes, were known anciently as "Pelasgians". Before the time of Hellen, son of Deucalion ... the country went by the names of the different tribes, in particular of the Pelasgian. It was not till Hellen and his sons grew strong in Phthiotis, and were invited as allies into the other cities, that one by one they gradually acquired from the connection the name of Hellenes; though a long time elapsed before that name could fasten itself upon all. He regards the Athenians as having lived in scattered independent settlements in Attica but at some time after Theseus they changed residence to Athens, which was already populated. A plot of land below the Acropolis was called "Pelasgian" and was regarded as cursed, but the Athenians settled there anyway. ... mixed barbarian races speaking the two languages. There is also a small Chalcidian element; but the greater number are Tyrrheno-Pelasgians once settled in Lemnos and Athens, and Bisaltians, Crestonians and Eonians; the towns all being small ones. The historian Ephorus, building on a fragment from Hesiod that attests to a tradition of an aboriginal Pelasgian people in Arcadia, developed a theory of the Pelasgians as a people living a "military way of life" (stratiōtikon bion) "and that, in converting many peoples to the same mode of life, they imparted their name to all", meaning "all of Hellas". They colonized Crete and extended their rule over Epirus, Thessaly and by implication over wherever else the ancient authors said they were, beginning with Homer. The Peloponnese was called "Pelasgia". He goes on to add that the nation wandered a great deal. They were originally natives of "Achaean Argos" descended from Pelasgus, the son of Zeus and Niobe. They migrated from there to Haemonia (later called Thessaly), where they "drove out the barbarian inhabitants" and divided the country into Phthiotis, Achaia, and Pelasgiotis, named after Achaeus, Phthius and Pelasgus, "the sons of Larissa and Poseidon." Subsequently, "about the sixth generation they were driven out by the Curetes and Leleges, who are now called Aetolians and Locrians". From there, the Pelasgians dispersed to Crete, the Cyclades, Histaeotis, Boeotia, Phocis, Euboea, the coast along the Hellespont and the islands, especially Lesbos, which had been colonized by Macar son of Crinacus. Most went to Dodona and eventually being driven from there to Italy then called Saturnia. They landed at Spina at the mouth of the Po River. Still others crossed the Apennine Mountains to Umbria and being driven from there went to the country of the Aborigines. These consented to a treaty and settled them at Velia. They and the Aborigenes took over Umbria but were dispossessed by the Tyrrhenians. The author continues to detail the tribulations of the Pelasgians and then goes on to the Tyrrhenians, whom he is careful to distinguish from the Pelasgians. In his Description of Greece, Pausanias mentions the Arcadians who state that Pelasgus (along with his followers) was the first inhabitant of their land. Upon becoming king, Pelasgus was responsible for inventing huts, sheep-skin coats, and a diet consisting of acorns. Moreover, the land he ruled was named "Pelasgia". When Arcas became king, Pelasgia was renamed "Arcadia" and its inhabitants (the Pelasgians) were renamed "Arcadians". Pausanias also mentions the Pelasgians as responsible for creating a wooden image of Orpheus in a sanctuary of Demeter at Therae, as well as expelling the Minyans and Lacedaemonians from Lemnos. As for the Pelasgi, almost all agree, in the first place, that some ancient tribe of that name spread throughout the whole of Greece, and particularly among the Aeolians of Thessaly. He defines Pelasgian Argos as being "between the outlets of the Peneus River and Thermopylae as far as the mountainous country of Pindus" and states that it took its name from Pelasgian rule. He includes also the tribes of Epirus as Pelasgians (based on the opinions of "many"). Lesbos is named Pelasgian. Caere was settled by Pelasgians from Thessaly, who called it by its former name, "Agylla". Pelasgians also settled around the mouth of the Tiber River in Italy at Pyrgi and a few other settlements under a king, Maleos. In the absence of certain knowledge about the identity (or identities) of the Pelasgians, various theories have been proposed. Some of the more prevalent theories supported by scholarship are presented below. Since Greek is classified as an Indo-European language, the major question of concern is whether Pelasgian was an Indo-European language. Sir Edward Bulwer Lytton, an English writer and intellectual, argued that the Pelasgians spoke Greek based on the fact that areas traditionally inhabited by the "Pelasgi" (i.e. Arcadia and Attica) only spoke Greek and the few surviving Pelasgian words and inscriptions (i.e., Lamina Borgiana, Herodotus 2.52.1) betray Greek linguistic features despite the classical identification of Pelasgian as a barbaric language. According to Dr. Thomas Harrison of Saint Andrews University, the Greek etymology of Pelasgian terms mentioned in Herodotus such as θεοί (derived from θέντες) indicates that the "Pelasgians spoke a language at least 'akin to' Greek". In western Anatolia, many toponyms with the "-ss-" infix derive from the adjectival suffix also seen in cuneiform Luwian and some Palaic; the classic example is Bronze Age Tarhuntassa (loosely, "City of the Storm God Tarhunta"), and later Parnassus may be related to the Hittite word parna- or "house". These elements have led to a second theory, that Pelasgian was to some degree an Anatolian language, or that it had areal influences from Anatolian languages. Vladimir I. Georgiev, a Bulgarian linguist, asserted that the Pelasgians were Indo-Europeans, with an Indo-European etymology of pelasgoi from pelagos (Greek: Πέλαγος), "sea" as the Sea People, the PRŚT of Egyptian inscriptions, and related them to the neighbouring Thracians. He proposed a soundshift model from Indo-European to Pelasgian. In 1854, an Austrian diplomat and Albanian language specialist, Johann Georg von Hahn, identified the Pelasgian language with Ur-Albanian. This theory has been rejected by modern scholars. Albert Joris Van Windekens (1915—1989) offered rules for an unattested hypothetical Indo-European Pelasgian language, selecting vocabulary for which there was no Greek etymology among the names of places, heroes, animals, plants, garments, artifacts, social organization. His 1952 essay Le Pélasgique was critically received. One theory utilizes the name "Pelasgian" to describe the inhabitants of the lands around the Aegean Sea before the arrival of Proto-Greek speakers, as well as traditionally identified enclaves of descendants that still existed in classical Greece. The theory derives from the original concepts of the philologist Paul Kretschmer, whose views prevailed throughout the first half of the 20th century and are still given some credibility today. Groups of apparently non-Indo-European loan words in the Greek language, borrowed in its prehistoric development. Non-Greek and possibly non-Indo-European roots for many Greek toponyms in the region, containing the consonantal strings "-nth-" (e.g., Corinth, Probalinthos, Zakynthos, Amarynthos), or its equivalent "-ns-" (e.g., Tiryns); "-tt-", e.g., in the peninsula of Attica, Mounts Hymettus and Brilettus/Brilessus, Lycabettus Hill, the deme of Gargettus, etc. ; or its equivalent "-ss-": Larissa, Mount Parnassus, the river names Kephissos and Ilissos, the Cretan cities of Amnis(s)os and Tylissos etc. These strings also appear in other non-Greek, presumably substratally inherited nouns such as asáminthos (bathtub), ápsinthos (absinth), terébinthos (terebinth), etc. Other placenames with no apparent Indo-European etymology include Athēnai (Athens), Mykēnai (Mycene), Messēnē, Kyllēnē (Cyllene), Cyrene, Mytilene, etc. (note the common -ēnai/ēnē ending); also Thebes, Delphi, Lindos, Rhamnus, and others. Certain mythological stories or deities that seem to have no parallels in the mythologies of other Indo-European peoples (e. g., the Olympians Athena, Dionysus, Apollo, Artemis, and Aphrodite, whose origins seem Anatolian or Levantine). Non-Greek inscriptions in the Mediterranean, such as the Lemnos stele. There are, indeed, various names affirmed to designate the ante-Hellenic inhabitants of many parts of Greece – the Pelasgi, the Leleges, the Curetes, the Kaukones, the Aones, the Temmikes, the Hyantes, the Telchines, the Boeotian Thracians, the Teleboae, the Ephyri, the Phlegyae, &c. These are names belonging to legendary, not to historical Greece – extracted out of a variety of conflicting legends by the logographers and subsequent historians, who strung together out of them a supposed history of the past, at a time when the conditions of historical evidence were very little understood. That these names designated real nations may be true but here our knowledge ends. The poet and mythologist Robert Graves asserts that certain elements of that mythology originate with the native Pelasgian people (namely the parts related to his concept of the White Goddess, an archetypical Earth Goddess) drawing additional support for his conclusion from his interpretations of other ancient literature: Irish, Welsh, Greek, Biblical, Gnostic, and medieval writings. Some Georgian scholars (including R. V. Gordeziani and M. G. Abdushelishvili) connect the Pelasgians with the Ibero-Caucasian peoples of the prehistoric Caucasus, known to the Greeks as Colchians and Iberians. Contrary to what Prokopiou suggests about the results of the American excavations near the Clepsydra, Sara Immerwahr in her definitive publication of the prehistoric material unequivocally states that no Dimini-type pottery was unearthed. Wikimedia Commons has media related to Pelasgians. ^ According to Prokopiou: "Some forty years ago excavations on the Athenian Acropolis and on other sites in Attica brought to light many indications of neolithic life - dwellings, vases, tools, skeletons of sheep - which confirmed the traditions recorded by Herodotus that the Athenians were descended from the Pelasgians, the neolithic inhabitants of Thessaly. Indeed the neolithic vases of Attica date from the earliest neolithic age (5520–4900) like the ceramics from the Thessalian acropolis of Sesclos, as well as from the later neolithic age (4900–3200) like those from the other Thessalian acropolis of Dimini...The search for traces of the neolithic age on the Acropolis began in 1922 with the excavations of the Italian Archaeological School near the Aesclepium. Another settlement was discovered in the vicinity of the Odeion of Pericles where many sherds of pottery and a stone axe, both of Sesklo type, were unearthed. Excavations carried out by the American Classical School near the Clepshydra uncovered twenty-one wells and countless pieces of handmade pottery, sherds of Dimini type, implements of later Stone Age and bones of domestic animals and fish. The discoveries reinforced the theory that permanent settlement by farmers with their flocks, their stone and bone tools and ceramic utensils had taken place on the rock of the Acropolis as early as the sixth millennium." ^ Professor Della Seta reports: "The lack of weapons of bronze, the abundance of weapons of iron, and the type of the pots and the pins gives the impression that the necropolis belongs to the ninth or eighth century BC. That it did not belong to a Greek population, but to a population which, in the eyes of the Hellenes, appeared barbarous, is shown by the weapons. The Greek weapon, dagger or spear, is lacking: the weapons of the barbarians, the axe and the knife, are common. Since, however, this population...preserves so many elements of Mycenaean art, the Tyrrhenians or Pelasgians of Lemnos may be recognized as a remnant of a Mycenaean population." ^ French reports: "The fourth and final season of the survey of the Skourta plain was conducted in 1989 by M. and M.L.Z. Munn (ASCS). Explorations begun in 1985 and 1987 were extended into new parts of the plain and surrounding valleys, so that by now a representative portion (approximately 25%) of most of the inhabitable areas of the three koinotites of Pyli, Skourta, and Stefani have been examined intensively. 66 sites were discovered or studied for the first time in the course of this highly productive season, yielding a total of 120 premodern sites studied by our survey since 1985. The survey should have identified all major settlement sites (over 5 ha) and a representative sample of smaller sites in the study area. A summary of the chief conclusions to be drawn from the four seasons can be made...MH settlement is established on two summits overlooking the plain...one of which, Panakton...becomes the most substantial LH site in the area. A fortified MH settlement is also established on a peak in rugged country beyond the NE edge of the plain...between the Mazareika and Vountima valleys, in which other settlements are established in the LH era...The remoteness of this NE sector, and the great natural strength of the MH site and a nearby LH IIIC citadel...suggest that the inhabitants of these glens and crags sought to protect and separate themselves from peoples beyond the peaks that surrounded them, perhaps because they were ethnically distinct and economically more or less independent of the Myc Greeks who dominated the plains. Traditions of Pelasgians in these mountains at the end of the BA raise the possibility that these may have been Pelasgian sites. Once abandoned, in the LH IIIC or PG eras, most of these sites in the NE sector are not again inhabited for well over a millennium. Elsewhere, within the more accessible expanse of the Skourta plain itself, LH settlements are established on many sites which are later again important in the C era..."
^ Abel 1966, p. 13: "Common fifth century tradition claimed not only that the Pelasgians were the oldest inhabitants of Greece and among the ancestors of the Greek heroes." ^ Brug 1985, p. 41: "The Greek sources identify the Pelasgians as forerunners of the Greeks in the Peloponnesus and Attica." ^ "Ionian". Encyclopaedia Britannica. Encyclopaedia Britannica, Inc. Retrieved 5 April 2017. ^ Sakellariou 1977, pp. 101–104. ^ Aristophanes. The Birds, 1355ff. ^ Murray 1960, p. 43. ^ Pokorny 1969, pp. 831–832. ^ Gladstone 1858, Chapter 2, Section 3, "Derivation of the Pelasgian Name", pp. 211–215. ^ Klein 1966, "Pelasgian and Pelagic". ^ Gladstone 1858. The Pelasgians are covered especially in Volume I. ^ Homer. Iliad, 2.840–2.843. The camp at Troy is mentioned in Iliad, 10.428–10.429. ^ Not the same as the Larissa in Thessaly, Greece. Many towns bearing the same (or similar) name existed. ^ Homer. Odyssey, 19.175–19.177 (Robert Fagles's translation). ^ Homer. Odyssey, Book 19 (T.E. Lawrence's translation). ^ Hesiod, fr. 319 M–W = Strabo. Geography, 7.7.10. ^ Prichard 1841, p. 489. ^ Aeschylus. The Suppliants, Lines 249–259. ^ Aeschylus. The Suppliants, Lines 262–263. ^ Aeschylus. The Suppliants, Lines 128–129. ^ Aeschylus. The Suppliants, Lines 154–155. ^ Aeschylus. The Suppliants, Lines 279–281. ^ a b c Strabo. Geography, 5.2.4. ^ Sophocles & Dindorf 1849, Fragment 256 (p. 352). ^ Euripides. Orestes, Lines 857 and 933. ^ Euripides. The Phoenician Women, Line 107. ^ Hecataeus of Miletus & Klausen 1831, Fragment 224 (p. 140). ^ Hecataeus of Miletus & Klausen 1831, Fragment 375 (p. 157). ^ Mentioned in Pseudo-Apollodorus, Bibliotheca 2.1. ^ Hellanicus fr. 36 Fowler, p. 173 (apud Scholia (T+) Iliad 3.75b); cf. Hellanicus fr. 7 Sturtz, pp. 49–51; Homer. Iliad, 3.75. ^ Dionysius of Halicarnassus, Roman Antiquities 1.28.3 (citing Hellanicus, Phoronis) = Hellanicus fr. 4 Fowler, pp. 156–157; cf. Hellanicus fr. 76 Sturtz, pp. 108–109. ^ Herodotus. Histories, 2.51. The text allows two interpretations, that Pelasgians were indigenous there or that they had been resettled by Athens. ^ Buck 1979, p. 79. ^ Thucydides. History of the Peloponnesian War, 1.3.2. ^ Thucydides. History of the Peloponnesian War, 4.109.4. ^ Dionysius of Halicarnassus. Roman Antiquities, 1.17. ^ Pausanias. Description of Greece, 8.1.4. ^ Pausanias. Description of Greece, 8.1.5 and 8.1.6. ^ Pausanias. Description of Greece, 8.4.1. ^ Pausanias. Description of Greece, 3.20.5. ^ Pausanias. Description of Greece, 7.2.2. ^ Lytton 1837, pp. 5–8. ^ Harrison 1998, pp. 25–26: "Herodotus' account, for example, of the adoption by the Pelasgians of the names of the gods (2.52.1) suggests a much closer relationship between the Pelasgian and Greek languages. Before they heard the names of the gods, the Pelasgians (assuming, interestingly, the existence of a number of gods) called them simply θεοί, on the grounds that they had 'established (θέντες) all affairs in their order'. This etymology, advanced apparently in all seriousness, seems to suggest that the Pelasgians spoke a language at least 'akin to' Greek." ^ Georgiev 1961; Georgiev 1977. ^ Hahn 1854, IV. Sind Die Albanesen Autochthonen?, pp. 211–279. ^ Stephanie Schwandner-Sievers and Bernd Jürgen Fischer, editors of Albanian Identities: Myth and History (Bloomington: Indiana University Press 2002), present papers resulting from the London Conference held in 1999 entitled "The Role of Myth in the History and Development of Albania". The "Pelasgian" myth of Albanians as the most ancient community in southeastern Europe is among those explored in Noel Malcolm's essay, "Myths of Albanian National Identity: Some Key Elements, As Expressed in the Works of Albanian Writers in America in the Early Twentieth Century". The introductory essay by Stephanie Schwandner-Sievers establishes the context of the "Pelasgian Albanian" mythos, applicable to Eastern Europe generally, in terms of the longing for a stable identity in a rapidly opening society. ^ Van Windekens 1952; Van Windekens 1960. ^ As, for example, in Gordon Messing's extended review, criticizing point-by-point, in Language 30.1 (January–March 1954), pp. 104–108. ^ Schachermeyr 1976; Mellaart 1965–1966; Mellaart 1975, "Southeastern Europe: The Aegean and the Southern Balkans". ^ Grote 1862, pp. 43–44. ^ Graves 1990, Volume 1. ^ Gordeziani 1985; Kaigi 1969, M. G. Abdushelishvili, "The Genesis of the Aboriginal Population of the Caucasus in the Light of Anthropological Data". ^ Prokopiou & Smith 1964, pp. 21–22. ^ Immerwahr 1971, p. 19: "It is the Late Neolithic period that provides most of our parallels, yet, curiously, the striking Dimini-type painted wares of Thessaly are completely lacking, and there is only one small recognisable sherd of the related Mattpainted ware of Central and Southern Greece." ^ Heffner 1927, pp. 123–124. ^ The American Forum for Global Education 2000. ^ French 1989–1990, "Skourta Plain project", p. 35. Abel, V. Lynn Snyder (1966). Fifth Century B.C. Concepts of the Pelasgians. Stanford, CA: Stanford University. Beekes, Robert (2009). Etymological Dictionary of Greek. Leiden: Brill. ISBN 978-90-04-17418-4. Brug, John Frederick (1985). A Literary and Archaeological Study of the Philistines. Oxford: British Archaeological Reports. ISBN 9780860543374. Dionysius of Halicarnassus. Roman Antiquities, Volume I: Books 1-2. Translated by Earnest Cary. Loeb Classical Library No. 319. Cambridge, Massachusetts: Harvard University Press, 1937. Online version by Bill Thayer. Online version at Harvard University Press. Finkelberg, Margalit (2006). Greeks and Pre-Greeks: Aegean Prehistory and Greek Heroic Tradition. Cambridge: Cambridge University Press. ISBN 978-0-521-85216-6. Fowler, R. L. (2001), Early Greek Mythography: Volume 1: Text and Introduction, Oxford University Press, 2013. ISBN 978-0198147404. French, E. B. (1989–1990). "Archaeology in Greece 1989-90". Archaeological Reports (36): 2–82. doi:10.2307/581027. Georgiev, Vladimir Ivanov (1937). Urgriechen und Urillyrier (Thrako-Illyrier) (in German). Sofia, Bulgaria: Imprimerie de la Cour. Georgiev, Vladimir Ivanov (1941). Vorgriechische Sprachwissenshaft (in German). Sofia, Bulgaria: Universitätsdruckerei. Georgiev, Vladimir Ivanov (1961). La toponymie ancienne de la péninsule balkanique et la thèse mediterannée, Sixth International Onomastic Congress, Florence-Pisa, April 1961 (Bulgarian Academy of Sciences), 1961 (in French). Sofia, Bulgaria: Bulgarian Academy of Sciences. Georgiev, Vladimir Ivanov (1977). Trakite i tehnijat ezik (in Bulgarian). Sofia, Bulgaria: Bulgarian Academy of Sciences. Gladstone, William Ewart (1858). Studies on Homer and the Homeric Age. I. Oxford, United Kingdom: Oxford University Press. Graves, Robert (1990) . The Greek Myths. 1. London, United Kingdom: Penguin Books. ISBN 978-0-14-001026-8. Grote, George (1862). A History of Greece: From the Earliest Period to the Close of the Generation Contemporary with Alexander the Great. II. London, United Kingdom: John Murray. Hahn, Johann Georg von (1854). Albanesische Studien (in German). Jena: F. Mauko. Harrison, Thomas (1998). "Herodotus' Conception of Foreign Languages" (PDF). Histos. 2: 1–45. Heffner, Edward H. (January 1927). "Archaeological News: Notes on Recent Archaeological Excavations and Discoveries; Other News (July–December 1926)". American Journal of Archaeology. 31 (1): 99–127. Immerwahr, Sara Anderson (1971). The Athenian Agora: The Neolithic and Bronze Ages. 13. Princeton, New Jersey: The American School of Classical Studies at Athens. ISBN 0-87661-213-3. Lytton, Sir Edward Bulwer (1837). Athens: Its Rise and Fall. I. London: Saunders and Oatley. Mellaart, James (1965–1966). "Catal Hüyük, A Neolithic City in Anatolia". Proceedings of the British Academy. 51: 206–208. Olcott, William Tyler (1914). Sun Lore of All Ages. Rain, Tedd St (Foreword by). New York and London: G. P. Putnam's Sons. Retrieved 11 March 2013. Pokorny, Julius (1969). Indogermanisches Etymologisches Wörterbuch (in German). New York, New York: French and European Publications, Incorporated. ISBN 0-8288-6602-3. Prichard, James Cowles (1841). Researches Into the Physical History of Mankind: Containing Researches into the History of the European Nations. III (3rd ed.). London, United Kingdom: Sherwood, Gilbert and Piper. Sakellariou, Michael B. (1977). Peuples Préhelléniques d'Origine Indo-Européennee (in French). Athens, Greece: Ekdotike Athenon. Schachermeyr, Fritz (1976). Die Ägäische Frühzeit: Forschungsbericht über die Ausgrabungen im letzten Jahrzehnt und über ihre Ergebnisse für unser Geschichtsbild. Bd. I. Die Vormykenischen Perioden des Griechischen Festlandes und der Kykladen (in German). Vienna, Austria: Verlag der Österreichischen Akademie der Wissenschaften. Thucydides, Thucydides translated into English; with introduction, marginal analysis, notes, and indices. Volume 1., Benjamin Jowett. translator. Oxford. Clarendon Press. 1881. Online version at the Perseus Digital Library. Van Windekens, Albert Joris (1952). Le Pélasgique: Essai sur une Langue Indo-Européenne Préhéllenique (in French). Louvain-la-Neuve, Belgium: Université de Louvain, Institut Orientalistique. Van Windekens, Albert Joris (1960). Études Pélasgiques (in French). Louvain-la-Neuve, Belgium: Université de Louvain, Institut Orientalistique. Christopoulos, George A.; Bastias, John C. (1974) . "Pelasgians". History of the Hellenic World: Prehistory and Protohistory. University Park, Pennsylvania: The Pennsylvania State University Press. pp. 368–370. ISBN 0-271-01199-8. Mackenzie, Donald Alexander (1917). Myths of Crete and Pre-Hellenic Europe. London, United Kingdom: Gresham Publishing Company. Munro, J. A. R. (1934). "Pelasgians and Ionians". The Journal of Hellenic Studies. 54: 109–128. doi:10.2307/626855. Myres, J. L. (1907). "A History of the Pelasgian Theory". The Journal of Hellenic Studies. 27: 170–225. doi:10.2307/624440.